This or That by Crispin Boyer. Review: Do you like puns, games and facts? 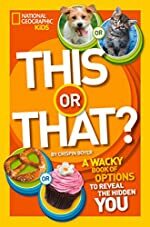 If you do, This Or That, The Wacky Choices To Reveal The Hidden You by Crispin Boyer IS THE BOOK FOR YOU! The point of the book is to pick one or the other, and then in the next page it shows a real life equivalent of it and facts about it. For example, Teleport or Virtual Reality and in the next page I'll talk about atom transportation and oculus rift. On some pages, if you picked this more than that you are adventurous. There are 9 chapters, and the first chapter, Power Up, is about superhuman powers. The second chapter, Good To Go, is about going to places. The 3rd chapter, Help Wanted, is about jobs. The 4th chapter, Gross Anatomy, is about weird body functions. The 5th chapter. Misadventures, is about exploring. The 6th chapter, Friend Zone, is about your social life. The 7th chapter, Mad Science, is about scientific concepts. The 8th chapter, Offbeat Facts, is about doing things that will scare you. The final chapter, Absurd Situations, is about crazy scenarios. In summary, the entire book is filled with fascinating choices. In my opinion, this book is really interesting, and it made reading a fun experience. This book is for both boys and girls because there are female topics and male topics. Some of the vocabulary is very simple and some is higher level. The book also uses slang, for example, LOL and OMG. If a person doesn't understand slang, then they would not like this book. Anyone who enjoys reading thought-provoking facts will LOVE THIS BOOK! Review written by Alex (6th grade student). Have you read This or That? How would you rate it?